A few hours ago, I saw the new outfit post of the StyleHeroine ( I 'm a huge fan of her style!) and I re-adored her dress! I have seen it and admired it online before, but it looked stunning on her! One thing I knew for sure: it reminded me of something similar I have seen! But what? .... And nta nta nta, that was it! 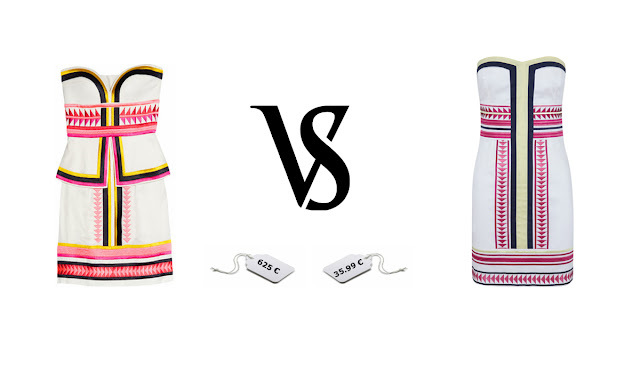 An ethnic print dress from Blanco that looks a lot to its Ideal competitor, with a huge price difference though! The Ideal dress is an embroidered dress from Sass + Bide (the it Australian design duo), costs 795$ (= 625 €) and you can see it in its full detail here!!! The Great Deal dress is a print dress (not embroidered!) and it can be yours for 35.99 € through all Blanco shops. I have to admit that I prefer the Ideal version this time! ;-) What about you??? Λίγες ώρες νωρίτερα, διάβαζα το νέο post της Ελληνίδας fashion blogger StyleHeroine (Λατρεύω το στυλ της!) και ξαναερωτεύτηκα το φόρεμά της! Είχα "ξαναπέσει πάνω του" σε ένα παλαιότερο χάζεμα σε ηλεκτρονικά καταστήματα μόδας, αλλά πάνω της έδειχνε εκθαμβωτικό! Και τότε αντιλήφθηκα ότι "Σ'έχω δει, κάπου-κάπου σε ξέρω", αλλά πού??? Και τσουπ, μου 'ρθε! Στο Blanco! Έτσι άλλο ένα Ideal vs Great Deal γεννήθηκε! Το Ideal φορεματάκι είναι Sass+Bide (το it Αυστραλιανό σχεδιαστικό δίδυμο), με κεντημένο ethnic σχέδιο και τιμούλα 625 € (τιμούλα δεν τη λες, αλλά είμαι υπεράνω!) και μπορείτε να το χαζέψετε εδώ! Από την άλλη, το Great Deal φέρει το ethnic σχέδιο σε τύπωμα αλλά κοστίζει και 589 € λιγότερα ( = 35,99 €) οπότε πρέπει να κάνουμε και εμείς μια υποχώρηση! Πωλείται στα Blanco! Παραδέχομαι, ότι αυτή τη φορά προτιμώ σαφέστατα την Ideal εκδοχή! ;-) Εσείς??? Hi Olga! congrats what a genial find!! :) This dress is so cute and the cheap one is also more lovely! :) Kisses and have a nice day! Amazing,it is so much cheaper but looks so good!Great find! Gia alli mia forema fovero evrima! Ontws einai sygkenika foremata. Ok to Sass+Bide einai pio prosegmeno alla kai to Blanco einai mia poly kali prospa8eia! WOWOWOW- what similar dresses!!! That is CRAZY similar! WOWOOWWOWO! I had to take a double look! I LOVE them BOTH!!! What a fab summer dress! Τρομερή διαφορά στην τιμή και το φτηνότερο είναι πιο ωραίο κατά την γνώμη μου!! I actually really like the cheaper version - it looks divine. Wow , similar dress! I like both! God, they look so alike :) great find. Might have to check out Blanco. Never heard of it til now! omfg, i'd go for the cheapest one! definitely! To akriboytsiko εχει ωραια εντονα χρωμα ομως ανετα θα φοραγα και το Blanco! I prefer the original one aswell, but I wouldn't mind settling for the Blanco version..
posooo teleio einai to original omws e?